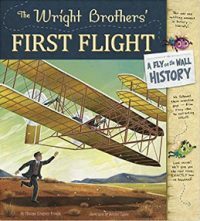 A Fly on the Wall History: The Wright Brothers’ First Flight | Thomas Kingsley Troupe — Writer. Filmmaker. Action Hero. Buzz alongside two cartoon flies as they follow Orville and Wilbur Wright on their Quest for flight, providing hearty blend of facts and fun while telling the story of a true great moment in American and aviation history.